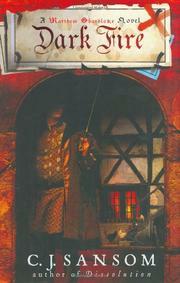 Tudor barrister Matthew Shardlake (Dissolution, 2003) plumbs the mysteries of Byzantine flame-throwing as he fights for the life of an accused murderess. The clever hunchbacked investigator is again dragged into the political machinations of Henry VIII’s chief minister Thomas Cromwell when Shardlake’s defense of Elizabeth Wentworth, a beautiful 18-year-old accused of murdering her young cousin Ralph, fails to move the judge. Elizabeth’s refusal to speak or plea has resulted in her being sentenced to peine forte et dure, death by the slow imposition of rocks on her fragile young body. The horrible fate is postponed by the intervention of Lord Cromwell, who needs Shardlake’s investigative skills and needs them now. Cromwell’s stock with His Majesty plummeted when the king came face to face with his latest wife, Anne of Cleves, a hefty, un-lovely German protestant princess picked out by Cromwell. Now Cromwell’s bitter enemy, the Catholic Duke of Norfolk, is dangling his young niece Catherine Howard before the easily distracted monarch. To regain the king’s favor Cromwell has promised a demonstration of Greek Fire, a sort of Eastern Roman napalm, just the ticket to keep the French and Spanish at bay. Alas, the formula for Greek Fire, which had been in the hands of a shady solicitor and his brother, has gone missing, and bodies have started to drop. Cromwell teams the barrister with Jack Barak, a tough, trusted employee with little respect for lawyers. The seemingly ill-matched investigators start picking through all levels of London society, arriving ever just too late after pertinent murders and arson, dogged everywhere by a pair of singularly repulsive assassins. The usual Renaissance muck and stench are aggravated by the worst heat wave anyone can remember. And there is a bit of wistful romance for the lawyer who has no idea how attractive he is, handicap notwithstanding. Rich period detail and solid history underpin the totally imaginary Greek Fire business.